WHEN you sell a property in Spain, there are various taxes you are required to pay to municipal and national authorities, on gains in the value of the land and capital gains, as well as any mortgage cancellation costs. Once a sale is completed, the seller is liable for various taxes which must be paid to different authorities. The first is the Impuesto de Plusvalía (equivalent to capital gains tax), which is charged by your local town hall. This is calculated as a percentage of the change in value of the land on which the property stands and varies from town to town. It’s worth noting that, even if you sell your property at a loss in terms of the sale price being lower than the price you paid, you can still be liable for this tax, as it is charged on the increase in value over the term of ownership, rather than prices paid. Obviously, the longer you have owned a property, the higher the tax. I heard about a recent case where someone who had owned a property for more than 20 years had to pay a plusvalía of 50,000 euros. So, it is vital you calculate this cost before you put your property on the market or agree a selling price. Then, there’s the Impuesto Sobre la Renta (the equivalent of income tax), which is payable to Hacienda (Spain’s central tax authorities). The taxable base is the difference between the original purchase price (plus taxes and costs incurred) and the sale price (minus taxes and costs), and is calculated depending on the seller’s status. If your property is mortgaged and the mortgage is to be paid off when the sale is completed, then all the costs incurred are normally the responsibility of the seller. Finally, one of the biggest costs for sellers in Spain is the commission paid to estate agents. This is normally 5% of the agreed sales price, plus VAT. To sellers from overseas, this may seem high, but, this is an open, very competitive marketplace and unless your agent works out of a bar (and some do…) every agent I know that has tried to charge less eventually goes out of business. All the other costs which arise from the sale of a property and its transfer to another owner – land registry fees, transfer tax and VAT, the notary’s fees for the new escritura, and the Impuesto Sobre Actos Jurídicos Documentados (AJD, the equivalent to stamp duty) – are usually paid by the buyer. Adam, I have read your article with interest but it still does not justify why estate agents in Spain charge so much. How can charging less mean you end up going bankrupt? I have literally just phoned an estate agent I use here in the UK and asked how much they charge for sales and he said 1.25% plus VAT for sole agency and 2% plus VAT for multiple agency but most properties are getting offers within one week so there is no necessity to go multi agency. Bearing in mind the UK property market is working infinitely better than the Spanish property market, would it not be a good idea adopt a similar method of marketing in Spain? You say that the Spanish property market is competitive but you could have fooled me – it is far more competitive in the UK and the last time I bought a flat I virtually had to go through an interview process before the agent accepted my offer. This is the type of property market that Spain can only dream about. I do have experience of the Spanish property market because my partner and I are in the very unfortunate position of having had our property on the market for three years without a sale. Although we have owned our property in Spain for over 10 years, we will still have to sell it at a loss. Great investment. Of course this is not helped by all the bad publicity surrounding the demolitions by the Junta de Andalucia. To add insult to injury and given the already depressed state of the property market, we could well do without paying what works out to be an eye watering sum of money to an agent who has done very little. I am in Real Estate here in Marbella, despite what the press says, the property market here is very good. We are a small Real Estate company but have sold 14 properties so far this year. If the price and location is good it will sell no problem. I can assure you it is not depressed and do we do not do very little, we have 6 websites, we appear on dozens of property search websites too and work 7 days a week. Yes we charge 5% commission but does that matter if you are happy with your net price and it gets sold. I have been in Real Estate a long time including L.A and the U.K and I wouldn’t work any where else. First time I’ve seen a turkey vote for Christmas. Adam, though truthful as far as it goes, your article would deter both sellers and buyers. How come you are so honest? I thought estate agents had that organ surgically removed. Most have anyway. DEMOLITIONS, DEMOLITIONS, DEMOLITIONS, oh yes, they have not gone away. It does make me laugh when estate agents try to (a) justify charging 5% commission and (b) pretend the property market in Spain is good – yeah right. It might be just about functioning in Marbella but it is stone dead anywhere else. Until the lunatics at the Junta de Andalucia engage their brains and stop revoking building licences and demolishing so called illegal houses, the property market in Spain will remain depressed. There is no doubt that these demolitions are having an adverse affect on the Spanish property market and many potential buyers have no confidence in the Spanish legal system and why would they? Even if someone is buying a coastal apartment (apparently not affected by the demolitions) these horror stories will still put them off and they will ask themselves “do I really want to invest my hard earned money in a place that treats people like this?” and “if they can do this to people, what else can they do?”. Of course these demolitions are still happening with no end in sight. Last December yet more building licences (17 in all) were revoked in Alcaucin and demolition is expected to take place later this year. The Junta de Andalucia told council members that they would be removed from public office if they did not “tow the party line” and vote in favour of the licences being revoked – so much for democracy. The Mayor said it was the darkest day in his entire career. Many of the properties affected are owned by Brits which is why these stories are all over the UK press. It is in everyone’s interest to support the people who are caught up in this horrific situation through no fault of their own. They have been completely shafted. If all the above is not enough to put investors off, the associated costs with the sale and purchase of property in Spain are far too high. Purchase taxes are high and then the cost of selling is high (5% agents fees) not to mention being slapped with a massive plus valia bill which often runs into thousands of euros. Against this kind of backdrop, it is very difficult to make any serious money from the Spanish property market. Many people we have spoken to worry about buying a property that they would struggle to sell quickly if they needed to. We also know people who are desperate to sell because they want to leave but due to rising house prices in the UK and falling house prices in Spain, the gap is widening and they will be lucky if they can afford to buy a static caravan in Jaywick Sands. Read Adam’s piece and then buy a nice little place in the Cotswalds. Save yourself the madness that is the Spanish property system. All the agents do is mop up. Sure they are doing well, that’s because most people have had to halve their asking price! Being an estate agent is the most brain dead occupation one can work in lol. My parents recently sold their apartment on Mijas Costa at a huge loss – so much for people being happy with the net price. It was in a good location with sea views but they had to drop the price several times and ended up practically giving it away. During one viewing, the agent turned up with another agent (from a network) plus the viewers meaning there were 8 people crammed into a fairly small apartment. It was a joke. My parents and the viewers found the whole scenario utterly vulgar and very unprofessional. Apparently the agents came across as dripping with greed and obviously couldn’t even trust each other not to rip the other one off! Horrible. If they could have their time again, they would not buy the apartment. I think too many Brits simply can’t understand that each country has it’s own set of ‘values’, if you don’t like the way that business is done in a country – don’t buy there. Again research is something that is an alien concept to too many Brits. All of the points raised should have been known by potential buyers and therefore should come as no surprise. Here in France charges are about the same and French agents don’t put up for sale signs unless they have sole agency and the sellers are’nt around, otherwise potential buyers will approach the seller directly. I’m not stupid and would never buy an old French house – too cold in winter and too hot in summer and far too many regs. to comply with. Modern French houses are no better – always a sign of bad materials and design used to see an a/c unit outside a new house. So I want to buy land to build, great but the agents have a set price for land at the value I’m willing to pay – 11% yes that’s not a typo. Buying a piece of land approx. 1-2000 sq.m – €20-30,000 and they expect to make a lot of money for taking a prospect one time to look at the land. Surprise,surprise here in France there is a Dutchman that has a very good i/net site that charges very little for introducing a buyer with a seller, is there no such site in Spain? One good point in Spain used to be that there were no capital gains charges on shares or money market profits. Here in France there was set tax of 25% – now it is 50% on shares held for between 2 and 8 years and 35% on more than 8 years + social charges. There is no advantage to maintain out PEPs/ISAs living in France and both I and my partner Angela face some hefty bills but do we enjoy living in France yes, so it’s time to cough up or leave, we don’t expect other countries to be the same as the UK, as always – caveat emptor. Fred, apart your usual berating Spain/anything comments, it’s really annoying you never spell COTSWOLDS correctly!!! I did read of someone buying a repossession direct from a bank recently only for the taxman in Spain to slap an additional equivalent stamp duty on at a later date as the property was undervalued, even though they purchased it from the bank and there was no under the table money being exchanged. Apparently it came to several thousand euros. If you have the money there are some good deals but of course your average person who knows little about Spain would not be buying with the demolitions. I had a good wekeend over there just gone but 5 days in Spain in the last 6 months is not a lot. I spoke to a variety of people over there, I think I may have seen Dr Rev Derek Roger Stevens when I was over there but I kept my distance. Freap projecting his weakness (& look?) onto others. Do you really like white socks with sandals? All your posts sound simply strange with an undercurrent of bitter jealousy. Derek, are you an online stalker as well as a self-confessed troll and Spain noob? lol. if it was him and you did approach he may well have run away. Easy to be abusive via the net but face to face is a different matter. Hoping to visit both the Netherlands and Granada/Guadix this year. I have a pretty good idea what I will find in Andalucia but will be sad if what my Dutch friend says is true about change in the Netherlands – esta la vida. Stuart, you are right there but I am only pulling his leg and I have not been offended about anything he has said, even the rascist bit, which is not true of course. He is a lot more serious nowadays and it does make me laugh when he responds to some of his previous names he has gone under. I hope he does not use too many more though as the list has already been cut short. I liked it more when he talked about how happy he is in Spain, when he was off for his cup of tea in the Sun, no problems of houses being knocked down as he does not know anyone who this has happended to!! He has said some funny things although I did not think he was trying to be funny. I am near Guadix in the Summer. Read my comment Fred again. You’ve done exactly what I mentioned you imbecile ha ha ha. Dede cacca rev. whatever, what a nasty little troll you are, it’s alway the same with vertically challenged scrotes. 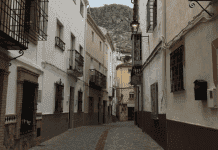 Reap, if your near Guadix you have to take a trip up the canyon road to Lugros, directions from either Guadix or from the autoroute are easy to follow. I have seen nothing to match this special place anywhere in Andaluz. In fact you would think you are somewhere in northern Europe. If I could have bought and got kosher planning consents I would have bought a horse shoe shaped promontary at the top – incredible views. Enough land to build a small number of alt.energy house which would have sold off plan to the Dutch and Germans but there would still be all these taxes and charges to find – est la vida. Derek you have zero credibility on this blog and have already been caught out trolling under multiple aliases – a gang of one person lol. You clearly have some form of personality disorder mixed with a stalking obsession, whereby you have to post off-topic responses to the same people over and over. Very sad. Coming back to thread, a person who has previously lived in Spain is perfectly entitled to comment about Spain, indeed those are exactly the people you want to hear from with their residency experiences. Talking about YOURSELF AGAIN Fred. You are totally delusional, and definitely have a notoriety on this blog (that’s not a delusional compliment by the way). Over time I’ve only combatted all your derisory comments against Spain, just for the sake of it every time, from yourself and Mr France above always. Although now he’s trying to be nicer I see. Better get your forked tongue out again Stuart! Derek, at least I post under one alias, and just to remind you again (just in case you forgot lol) you admitted you were a troll to the world on this very blog. A person who posts under multiple aliases is by definition delusional. You’ve combatted nothing. You must learn to debate properly and stop all the childish name-calling. Derek, I may not live there now, but I have lived there for one year previously, dealt with the local corrupt Town Planner, the Mayor, had kids in school there for a year, owned properties there for 15 years etc and I have a lot more experience than you dealing with the Spanish system. You have very little experience in dealing with anything reading your posts. It feels like you have only been there for a year and that is if you are not a mate of caca in Peckham. The most you have had to do is order a cup of tea in an English area. Most people with two brain cells can see that. Your style of writing is quite easy to spot, no substance and all rose tinted glasses and shoot from the hip. MORE DEMOLITIONS, MORE DEMOLITIONS, MORE DEMOLITIONS. The swivel eyed lunatics at the Junta de Andalucia are at it again, this time in Costa de la Luz. Please refer to story at the top of the website. I wonder if that is why this article has been relegated to the bottom of the page. Still never mind, caveat vendor.